Rent The Little Gatsby House on Watchic Lake, a charming elegant treasure built in 1908, still with many of it’s original furnishings. 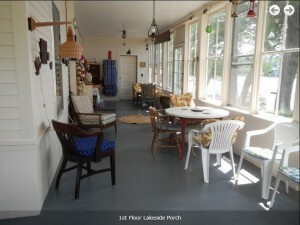 This cottage has close proximity to everything, 100 feet of lake frontage with beautiful views, peaceful surroundings, glorious sunsets, gentle breezes, and the call of the loons. It’s a place for a refreshing swim or some relaxing fishing or kayaking. With a gentle sloping beach and a full set of toys and sporting equipment it’s a great place for families with children. And for the adults in the group, internet access, cable TV and various electronics, make it nice place get away but also keep in touch. The enclosed porches which surround the cottage on three sides provide warm and dry living conditions in case of inclement weather as well as an open-air environment when the weather is fine. They span two stories and provide lots of area to enjoy dining, games, sleeping, reading, or quiet conversation. Once you step over the threshold you feel like you are entering into the past, into a time when life was simpler, slower, and more relaxing. If you live on the lake today, the Little Gatsby House could be a nice place friends and relatives to enjoy while visiting you. The Little Gatsby House is close by to local supermarkets, restaurants, a driving range, antique shops, art and craft galleries, clothing and gift shops. 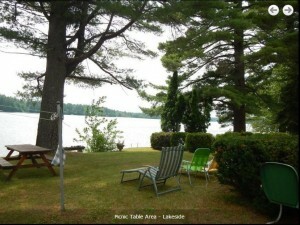 – all 10 minutes from the lake. And less than a half hours drive to visit the Old Port on Portland’s waterfront.